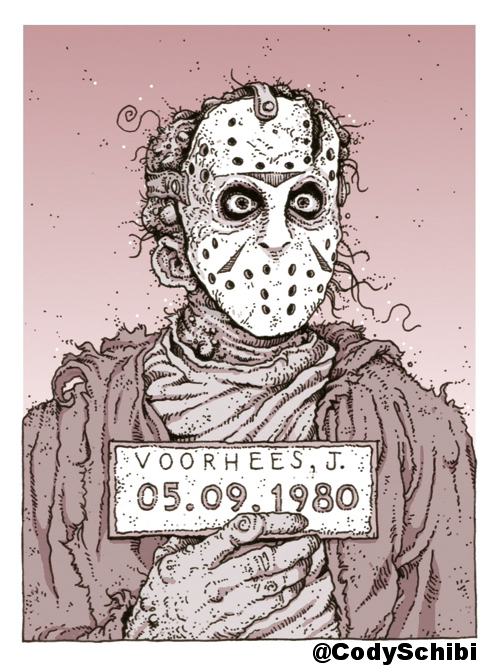 Drawing A Blank: The Art of Cody Schibi: Friday the 13th Ya'll! IT'S A QUICK FRIDAY THE 13TH GIVEAWAY!! YIPPEE!!!! 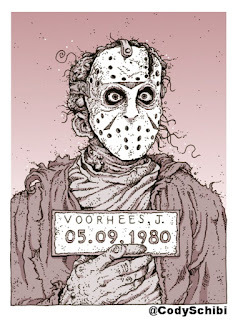 Here’s your chance to have the star of Friday the 13th himself show up at your doorstep…for FREE! All you have to do is follow me on Twitter & ReTweet the giveaway info & BANG(or HACKED rather)…you’re entered for a chance to win this signed “Monster MugShot - Jason’ trading card. You can order or simply check out the complete collection of my 'Monster MugShots at my store, or just continue to follow me for more giveaways.. Winner will be randomly chosen & announced late tonight via Twitter. FUN! Good luck & Happy Friday the 13th!